Congratulations to our winner, Robbin W. of Tinley Park, IL! 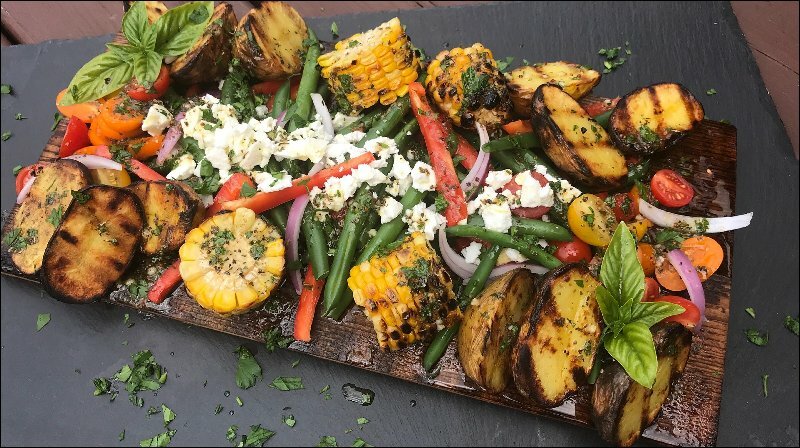 As you are “fully involved” with your Firehouse Hook & Ladder Sub, I might ask you to turn your attention to my take on a Grilled Picnic Salad. I grilled small golden potatoes and fresh corn to add a nice smoky flavor along with blanching green beans and tossing in with some fresh red bell pepper, sliced red onions and medley of tomatoes. I topped the salad with some nice fresh feta along with a bright, tangy and earthy vinaigrette made with extra virgin olive oil, white balsamic vinegar, stone ground mustard, honey, basil, oregano, fresh parsley, fresh garlic, salt & pepper. The salad is served on a grilled cedar plank, platter style so you can create your own personalized side. The vegetables and vinaigrette in the salad adds another fresh flavor level to the simple layering of monterey jack, turkey, ham and toppings found on the Firehouse Hook & Ladder. This salad can be served warm, room temperature, or cold. Don’t forget to soak-up any extra vinaigrette with your sub bread.